Show your Pride. Volunteer. In big ways or little ones. The most amazingest, biggest, bestest, firstest, funnest Gay Pride event is coming to Taos the weekend of August 21st. 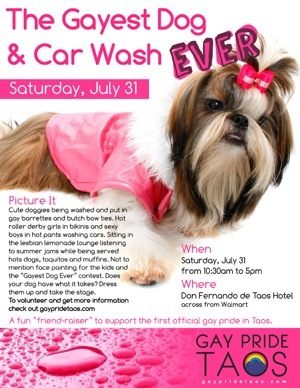 But before that, there’s the Gayest Dog and Car Wash Ever on July 31st. Scroll to the bottom to see the flier. Volunteers–young and old, short and tall, gay and straight–are needed to help out! You can attend planning meetings held every Tuesday at 6:30 pm at El Pueblito Methodist Church in El Prado. Or you can make phone calls, or volunteer out at events. All help is greatly appreciated! Please contact volunteer coordinator, Patrick Finn, at 758-1947. Don’t forget to visit the gay pride taos website for more fun and info.